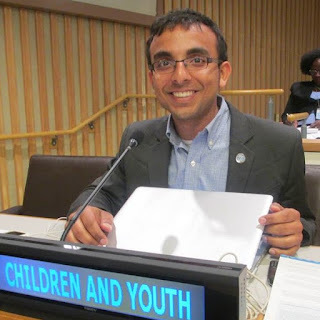 Aashish Khullar is one of the Organising Partners' of the UN Major Group for Children and Youth (MGCY). It is the formal engagement mechanism for young people to engage in UN processes. He focuses on the intersection of environmental and economic variables. The New Urban Agenda (NUA) has been finalised and we are moving closer to the Habitat III Conference in Quito (17-20 October 2016), where it will be formally adopted by member states. Thematic progress aside, the NUA galvanises an engaged and effective role for stakeholder participation in its means of implementation (MOI) and follow up and review provisions (FuR). This is a progressive continuation of the General Assembly resolutions 70/210 and 67/290 that set forth the modalities for the Habitat III process. The rumors that have been circulating for the last month have now proven to be true. 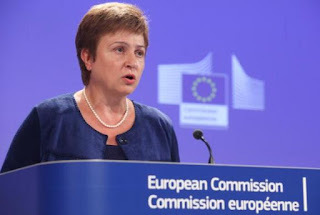 The Bulgarian government has withdrawn support from Irina Bokova as their candidate for UN Secretary General and replaced her with Kristalina Georgieva, the European commissioner for budget and human resources. We are down to nine candidates with Christiana Figueres withdrawal. 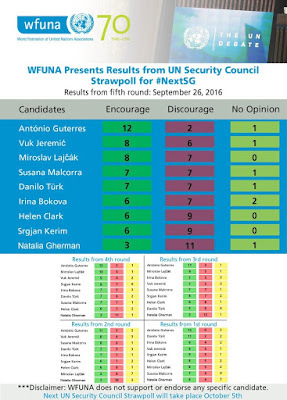 As you can see from the votes above Antonio Guterres remains the favorite for the new Secretary General. 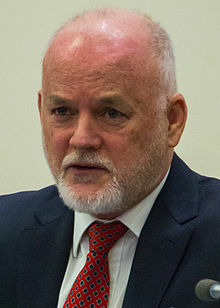 As you will have seen from my previous blogs on the subject though I think he has an excellent cv for the job he isn’t a woman nor one from the Eastern UN region -- whose turn it is. Although this rotation between regions has been an informal agreement it makes sense that the different regions of the world should have a turn to be UN Secretary General. It fits in with the universal nature of the organization and ensures different cultural interpretations of the job. If you have regional rotation, then the Western Europe and Other Group region have their turn next (Antonio Guterres is from a WEOG country) as the Secretary General after this. 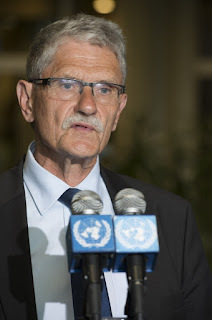 It’s been a busy week in New York with the Heads of State meetings and so it was only at the airport that yesterday that I saw the latest news that six candidates have been nominated for the next Director General of the World Health Organization. Dr. Sania Nishtar, Pakistan’s is former Federal Minister of Education & Training, Science and Technology, Information Technology and Health. Sania is the Chair of the Health Committee of the Aman ki Asha initiative, a campaign for peace between India and Pakistan, for which she has convened several meetings and negotiated declarations. On behalf of the Inter-agency and Expert Group on SDG Indicators (IAEG-SDGs), we would like to invite you to participate in an open consultation on possible refinements to the global indicator framework for the Sustainable Development Goals. In follow-up to the 47th Statistical Commission decision 47/101 (e), which “Requested the Inter‐Agency and Expert Group to take into account the specific proposals for refinements of the indicators made by Member States during the discussion”, the Inter-agency and Expert Group on Sustainable Development Goal Indicators (IAEG-SDGs) is conducting an open consultation on possible refinements for a limited set of indicators in the global indicator framework for the Sustainable Development Goals. Are we about to have a new candidate for UN Secretary General? The election process for UN Secretary General is getting very interesting. 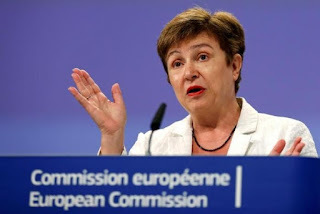 The UN is a wash with rumors of a late dark horse Kristalina Georgieva European Commissioner for Budget and Human Resources. As she is also from Bulgaria it would mean that the either the Bulgarian Government would have to withdraw their support for Irina Bokova. Discussion was due to happen on Tuesday this week within the Bulgarian Cabinet to decide if they were going to switch horses. Or another rumor as reported in the Sofia Globe circulating is that according to a tweet by Talal Al-Haj, UN bureau chief of television station Al-Arabiya, Georgieva will be nominated by Hungary, Latvia and Croatia, with the support of Germany. We are now less than four months away from the date on which the new Secretary­ General must take office. In consultation with the General Assembly, the Security Council has the responsibility to guide the selection process to its final resolution in an orderly and timely manner. Out of loyalty to the United Nations and in order to facilitate the advance of the selection process I hereby inform you that today I withdraw my candidacy to the position of Secretary ­General. I do so with gratitude and with concern. Guest blog by Eela Dubey. 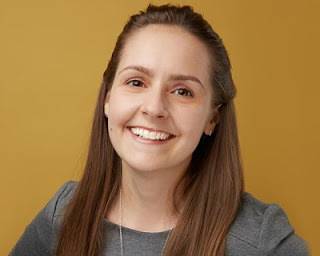 Eela is a former New Yorker who decided to leave a career in finance to follow in the footsteps of her grandfather, an esteemed Indian yoga guru. She spends most of her time traveling around the world and assisting his pranayama workshops. 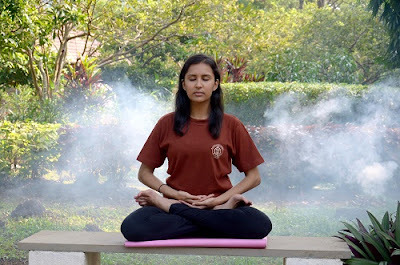 On the side, she is an independent consultant at Kaivalyadhama Yoga Institute and is an avid blogger of traditional yoga and ayurveda.